Lehmann Maupin is pleased to announce Fire (America), an exhibition of new works by Teresita Fernández. 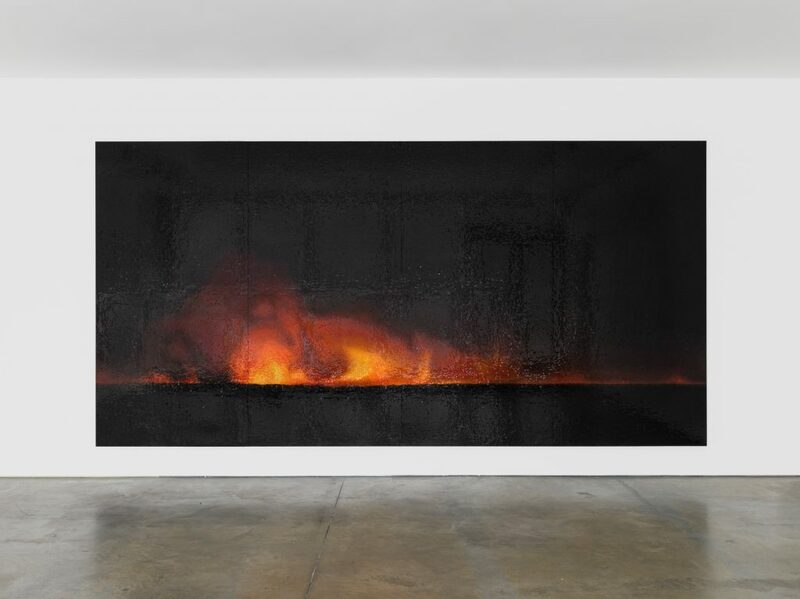 The exhibition will debut a 16-foot glazed ceramic wall panel depicting a nocturnal landscape engulfed in flames, as well as a new series of abstract landscapes made from burned paper. 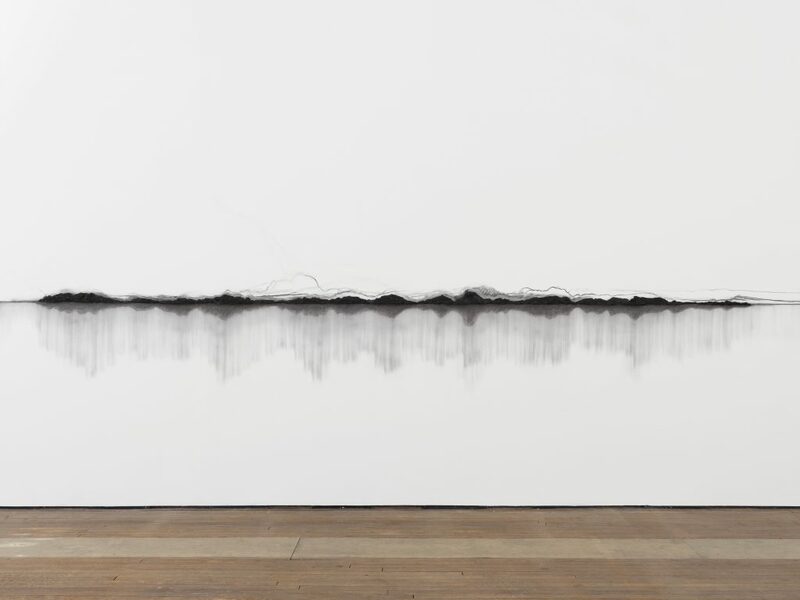 In addition, Fernández will create an immersive, 100-foot panoramic drawing on site comprised of built-up, dimensional layers of solid charcoal applied directly to the gallery’s walls. 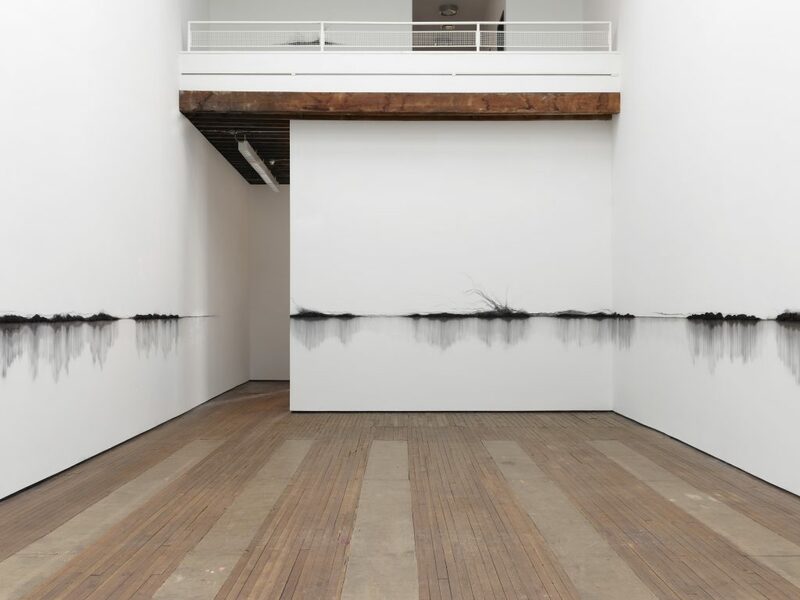 Titled Charred Landscape (America), the installation will circumnavigate the gallery, surrounding visitors, and dissolving into the white walls. 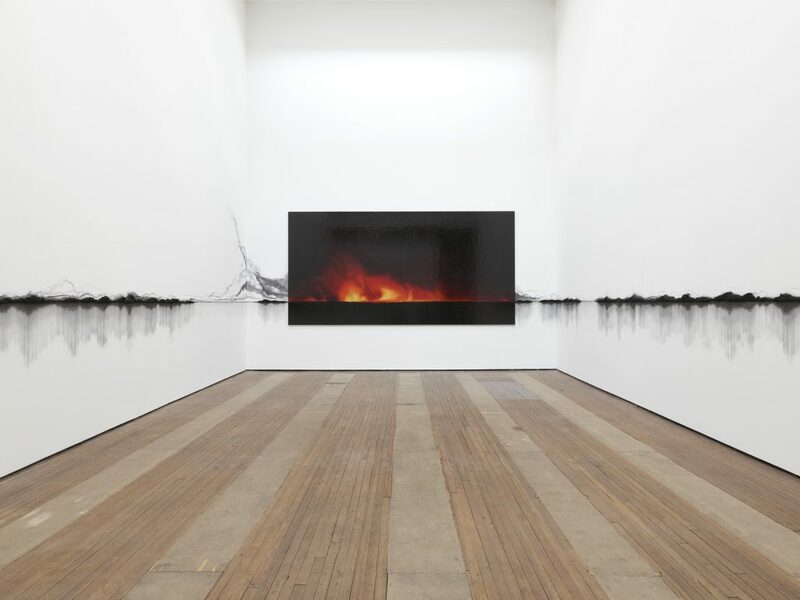 In Charred Landscape (America), pieces of raw, sculptural charcoal are affixed to the gallery walls to create the illusion of a 360-degree horizon. 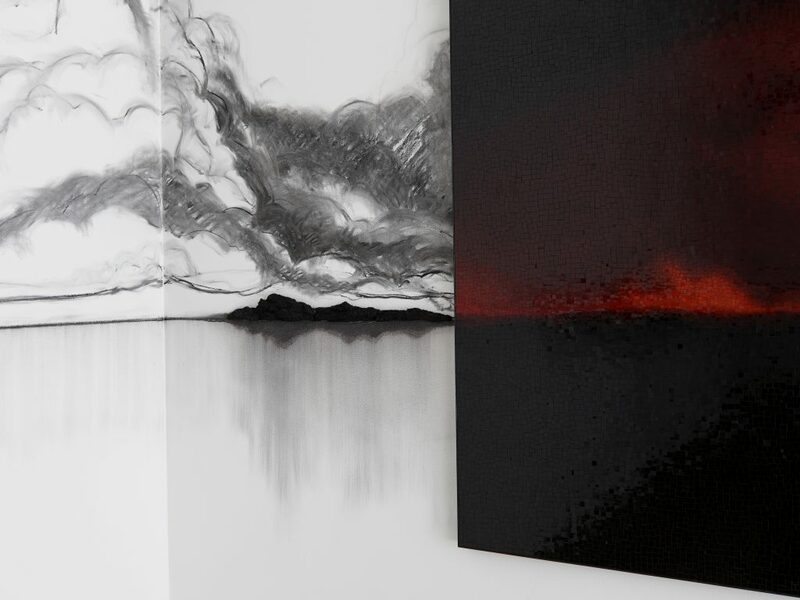 A dramatic charcoal drawing emerges from the horizon line and travels across the walls of the gallery to suggest an abstracted landscape scene shrouded in smoke. For me, landscape is about the history of people in places and how we position ourselves within those spaces. This new body of work seeks to redefine “landscape” as being far more than a fixed, framed vista in front of your eyes, by also considering what has happened on and to the land itself. I’m constructing an image of an invented landscape using real, physical components taken from the earth. The materials in these works—fired clay, burned paper, and lump charcoal—are literally components extracted from existing places which I use to create new landscape images. In this way, the pieces become an assembly of stacked landscapes, suggesting that we are always in more than one place simultaneously. By doing this, I’m acknowledging and physically weaving together their undeniable, intertwining histories. In both of these new works, Fernández continues to carefully merge the material and the conceptual. The glazed clay—earth—is baked at a high temperature—fire—to create the image of the earth ablaze in vitreous saturated colors set against a black night; extremes of darkness and light that become physical, material, and tactile, as well as metaphorical and poetic. Just as fire is used as a material component during the firing of the ceramic panel, charcoal—burned wood—becomes a self-referential material from which the landscape drawing is rendered. This beautiful and seamless unity of materiality and narrative is essential for Fernández, whose practice is based in an understanding and reinterpretation of the relationships between nature, identity, history, and economy. 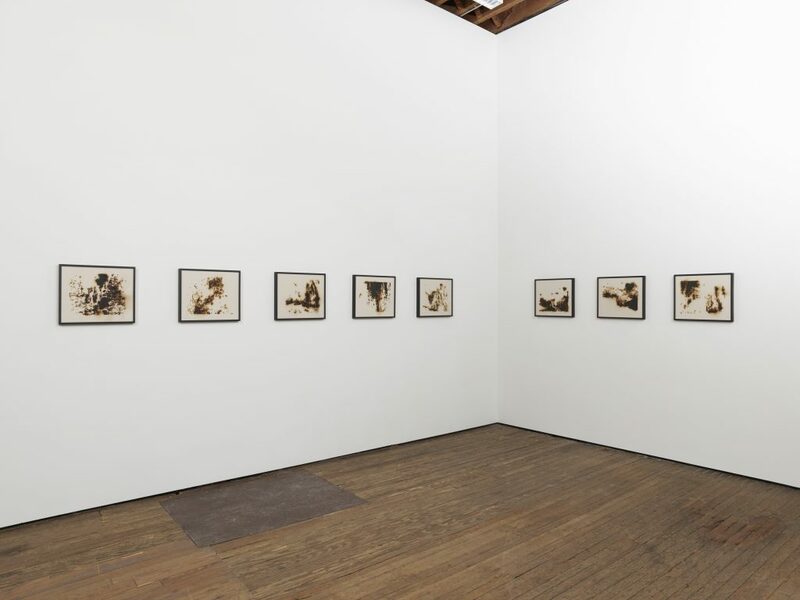 The power of Fernández’s work is to reveal to viewers their own connection to the space they occupy when standing in front of her work, as well as their place in the greater world.